Email marketing analytics is often disconnected from other online tracking systems such as Google Analytics. We rely on the email marketing software to tell us the open/click data. If we can view how users engage our emails (open/click) in one central place, Google Analytics, we will gain more insights on the performance of email marketing. In the previous blog we showed how to track email clicks with Google Analytics. In this post we will show how to track email opens. It’s simple. You just need to put the following code into the end of your email (html source code, before the </body> tag). Now let me explains the parameters. cid Client id. Can be your recipient’s email address. In our email platform, you may put [Email] and it will automatically be converted to the real email address. For more parameters, please refer to Google’s documentation. And this is a screenshot of how to find the tracking ID. If you set up correctly, you will find email opens in real time after your campaign is sent. 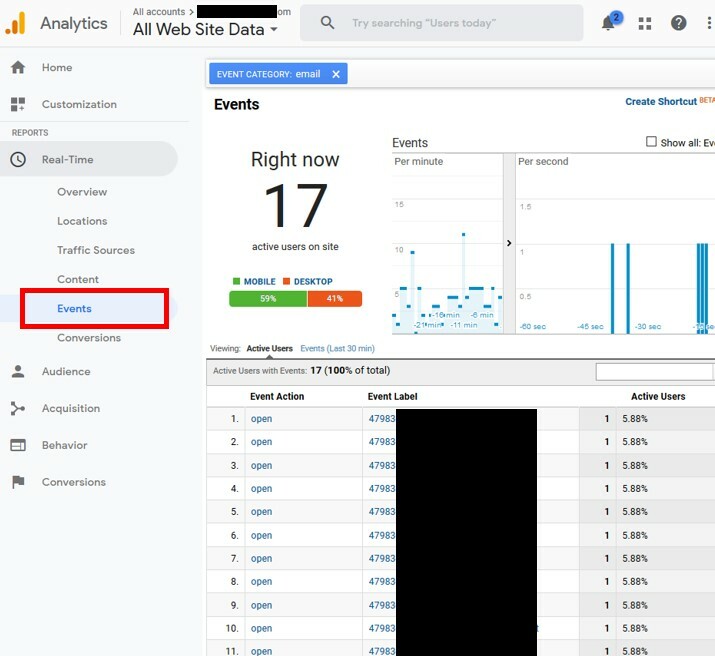 We can use Google Analytics to track our email campaigns (click and open).